The Chic Country Girl: 6 Week Christmas Cookie Countdown: Week 5 | M & M Chocolate Chip | The Perfect Christmas Eve Cookie for Santa! 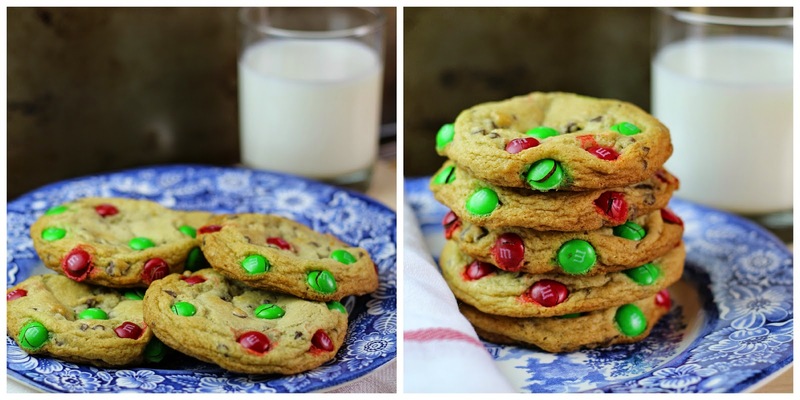 6 Week Christmas Cookie Countdown: Week 5 | M & M Chocolate Chip | The Perfect Christmas Eve Cookie for Santa! Christmas is fast approaching. After today we only have one more cookie. The cookie recipe I am sharing today would be perfect to leave out for Santa with a nice glass of milk. If I were Santa Claus I'd rather enjoy these M&M Chocolate Chip Cookies. I really wanted to make a Chocolate chip cookie for the "6 Week Christmas Cookie Countdown" I feel like they are the most classic cookie. My normal go to Chocolate Cookie is my Grandmas but I don't share that recipe with anyone. It's a secret family recipe and now that my Grandma is no longer with us its even more special to me and I will treasure it forever. So this is what I came up with. It's inspired by this cookie I get from a Chocolate / Sweets shop in a small Colorado mountain town. In bowl or stand mixer cream butter and white & brown sugar. Mix until smooth and add eggs. Mix. Add in salt, baking soda and vanilla. Mix through. Then start adding in your flour. Mix in 6 oz. of Mini Chocolate Chips. I then scooped them out with a medium sized cookie scoop (Approximately 2 tbsp). Once baked should measure 3 1/2 inches. If you'd prefer them smaller that works too, plus it will make more cookies. I then placed 4-5 M&Ms on top the scooped cookies. Make sure to press them lightly into dough so they stick.